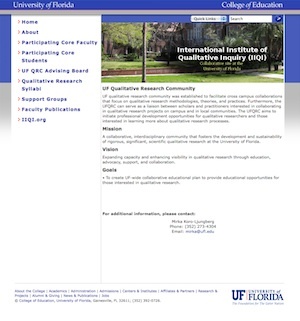 UF qualitative research community was established to facilitate cross campus collaborations that focus on qualitative research methodologies, theories, and practices. Furthermore, the UFQRC can serve as a liaison between scholars and practitioners interested in collaborating in qualitative research projects on campus and in local communities. The UFQRC aims to initiate professional development opportunities for qualitative researchers and those interested in learning more about qualitative research processes. A collaborative, interdisciplinary community that fosters the development and sustainability of rigorous, significant, scientific qualitative research at the University of Florida. Expanding capacity and enhancing visibility in qualitative research through education, advocacy, support, and collaboration. • To create UF-wide collaborative educational plan to provide educational opportunities for those interested in qualitative research.